Juan Bautista de Anza was the first European to establish an overland route from Mexico, through the Sonoran Desert, to the Pacific coast of California. New World Spanish explorers had been seeking such a route through the desert southwest for more than two centuries. 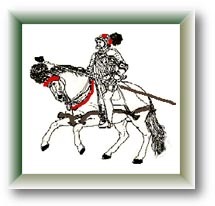 Born in Mexico in 1736, Anza joined the army in 1752 and served on the northern frontier of Sonora. In 1774, he led a small expedition from the presidio at Tubac (now in Arizona) to the mission at Monterey, California. The following year, he led a second colonizing expedition with livestock and more than 200 people, to establish the mission and presidio at what would become San Francisco. At the time of Anza's first expedition, the English still called California New Albion, the Russians were stalking the Pacific Northwest coast and the American Revolution was still years away. But starting in 1768, the Spaniards had already established a series of presidios and missions along the California coast as far north as Monterey. On January 9, 1774, 38-year-old Captain Anza left Tubac, Arizona, convinced he could find the long sought overland route through the desert to Alta California. His expedition included 21 soldiers, five mule packers, one interpreter, a carpenter and two personal servants. It also included a courier, two Franciscan friars and Sebastian Tarabal, a Baja California Indian who had just walked to Sonora from Mission San Gabriel (near Los Angeles) in California. The expedition began by heading 125 miles south down the Old Mission Trail to Caborca, in hopes of resupplying livestock that the Apaches had driven off the week before. From Caborca, they headed northwest toward the Colorado River with 140 saddle horses, 65 beef cattle and 35 mules. A week later, they arrived at Sonoita, Papago Indian country, across from what is now the international border adjoining Organ Pipe National Monument. The expedition continued northwest into friendly Yuma Indian territory, and on February 7th, arrived at the confluence of the Gila and Colorado rivers (present-day Yuma, Arizona) having traveled 375 miles. With the help of Yuman Chief Palma, Anza forded the Colorado and entered California. But instead of traveling 180 degrees due west to San Diego as later generations would do, he turned south down the river to the delta area of the Sea of Cortez. There, the expedition wandered lost among the sand dunes for a month, until Anza was forced to send half of his men and livestock back to Yuma. Anza finally discovered a route northwest, and with the remaining 25 men, emerged from the delta, crossing into the Yuha Desert west of Calexico, California, arriving at Yuha Wells on March 8th. Today, nearby Vista De Anza Monument in Imperial County commemorates this occasion. Thirty miles north, Anza camped at the junction of San Felipe and Carrizo creeks (present-day Harpers Well), a marshy springs at the northern base of the Superstition Mountains. He named the marsh San Sebastian for his guide, Tarabal, and after trading with some 400 Kumeyaay assembled there, continued northwest up San Felipe Wash into the Borrego Valley. The expedition arrived at the original Borrego Spring, five miles southeast of the present-day town of Borrego Springs, on March 12th, where he encountering another 60 Kumeyaay. A historic marker here indicates that Anza named the spring San Gregorio. The expedition then proceeded north up Coyote Creek wash through present-day Anza Borrego Desert State Park to Coyote Canyon where Coyote Creek suddenly flowed abundantly. Anza named his first camp in the canyon Santa Catarina (called Lower Willows today). Now in Cahuilla Indian country, they continued up Coyote Canyon through the pass between the San Jacinto and Santa Rose Mountains (which Anza named Royal Pass of San Carlos) into present-day Riverside County. Continuing their climb through one last steep gorge called Nance Canyon, the expedition emerged at an elevation of 4,000 feet overlooking the Cahuilla Valley. After another week's march through present-day Hemet and Riverside, across the Santa Ana and San Gabriel rivers, Anza and his expedition completed their historic mission. They arrived at the San Gabriel Mission (located on the eastern edge of present-day Los Angeles) on March 22, 74 days after leaving Tubac. Upon his arrival back in Tubac on May 26, after traveling more than 2,000 miles, Anza immediately began plans to return to Alta California with a colonizing expedition. A year later, after receiving permission and funding from Viceroy Bucareli in Mexico City, Anza began organizing his second expedition in the fall of 1775. Authorized to colonize the San Francisco Bay area by transporting 38 families, together with livestock and soldiers, he began to recruit from among the poor in Culiacan, 600 miles south of Tubac. The assembled expedition finally left from Tubac on October 23, 1775, with 245 people (155 of them women and children), 340 horses, 165 pack mules, and 302 cattle. Father Pedro Font was selected to accompany this expedition, because of his expertise with navigation, along with a number of soldiers, 28 of whom would remain at the presidio once it was built in the San Francisco Bay region. The diary Font kept remains one of the great historical documents of the time. Unlike the first expedition, this group headed north down the Santa Cruz River, arriving in Tucson on October 26. After meeting the Gila River on October 30, the expedition stopped for a day while Font and Anza visited the prehistoric ruins of Casa Grande on October 31th. It took a month for the expedition, following the Gila River west, to arrive at the Colorado River and affect a reunion with Chief Palma and his band of Yumans on November 28th. After crossing the frigid Colorado, the expedition separated into three groups so that everyone could drink from the slow-filling desert water holes. Unlike the first expedition, they headed due west past Pilot Knob, arriving again at Yuha Wells on December 11. From there, this expedition followed the same route to San Gabriel Mission as the first expedition. After a freak desert snowstorm killed a number of their livestock, they headed up Coyote Canyon, going through San Carlos Pass on December 26. They arrived in San Gabriel on January 4th, 74 days after leaving Tubac and 8 months after leaving Culiacan, the principle point of assemblage. De Anza had succeeded in leading an enormous expedition safely to its destination through 1,800 miles of desert wilderness. On February 17th, Anza and his expedition resumed their march north, traveling the familiar El Camino Real to Monterey, where they safely arrived on March 10th. While the colonists remained there, Anza with Font and a squad of soldiers spent the following month exploring the San Francisco Bay area. Before leaving, Anza designated the future site of both the San Francisco Presidio and Mission Dolores. On April 13, 1776, Juan Bautista de Anza left Monterey and returned to Tubac. On June 17th, the colonists left Monterey to sew the seeds for the city of San Francisco. Two weeks later on July 4, 1776, the 13 American colonies on the eastern shore of North America formally declared their independence from England. Upon his return to Sonora, Juan Bautista de Anza Anza was named governor of New Mexico. He died 12 years later on December 19, 1788 and was buried in Arizipe, Sonora, Mexico. Although rivals attempted to discredit his achievements, Anza's legacy is well established in history. He opened the overland corridor to the Pacific Southwest and had a primary role in the European settlement of California. Anza arrived in California with two more people than he had left with. Three children were born along the way; one woman died in childbirth. The colonists who traveled the Anza Trail also gave birth to the cities of Los Angeles, San Francisco and San Jose. Their cattle and horses provided the foundation stock for the vast herds which would establish the great ranchos of California in the following years. 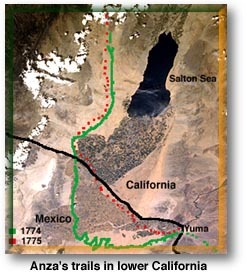 In 1990, U.S. Congress created the Juan Bautista de Anza National Historic Trail, comprising the overland route of the colonizing expedition from Tubac, Arizona to San Francisco, California. Today, the route is followed closely by paved highways. 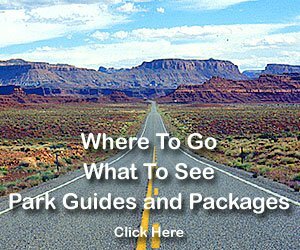 Portions of the trail are also available to hike or ride by horseback -- between Tumacacori National Historic Park and Tubac State Historic State Park in Arizona and in Anza-Borrego Desert State Park in California.